This book analyses the economic history of the nuclear program in Spain, from its inception in the 1950s to the nuclear moratorium in the early 1980s, and investigates the economic, financial and business origins of atomic energy in Spain. The actual dimension of the Spanish nuclear sector, which exceeded the relative economic and political clout of the country at the time, reflects the combinatio… n of domestic and foreign interests. 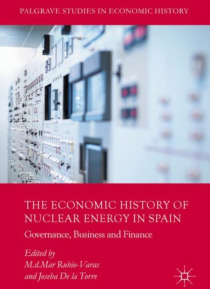 Each contribution inserts the Spanish case within the international development of nuclear energy, but also shows how the Spanish nuclear program came about, how it was financed, and who the main architects and beneficiaries at the industrial, financial, commercial and banking levels were; all without losing sight of the energy policy aspects such as energy mix and energy security. The volume provides useful analysis and sources for a variety of core fields across the social sciences including economic history of post-war Europe, industrial and energy policy, international relations and history of technology.